The humble Draft Excluder has been around for a long time, but many people don’t even think of using these very effective and yet very simple methods of keeping the warmth in your house. Draft Excluders are no longer something you only see when you visit your Gran! People are wising up to the heat and money saving benefits of Draft Excluders and now sales are on the rise as they are making their return. Everyone wants to come back to a warm home, but with energy costs rising everyone has to keep a closer eye on the thermostat and look for simpler and cheaper ways to achieve a warm house. Turning up the heating means turning up your heating bills and sometimes traditional methods are the way to go so now more than ever we should look back to the times when people put Draft Excluders against their doors as a way to keep the heat in and the cold out… everyone wants to save money at the moment and using a Draft Excluder is the most economical, quickest and easiest way to do it! With some draft excluders you get more bang for your buck – for example Woodlore now have a Draft Excluder which means not only can you keep out drafts and save on those expensive heating bills, but also it emits a fresh, natural scent of Cedar, so you get a warm house and a lovely smell to come back to! As you expect from Woodlore it’s superior quality – being heavy so it stays in place and is 94 cms (37”) in length and 12 cms (4 ¾”) in width and with an integral hanging hook. It’s available from Caraselle Direct in a beige material with dark brown trim. Also available from Caraselle Direct is the British Designed & British Made Luxury Draught Excluder in Rust & Beige. Available in two complimentary colours, the chunky size will block out those drafts. 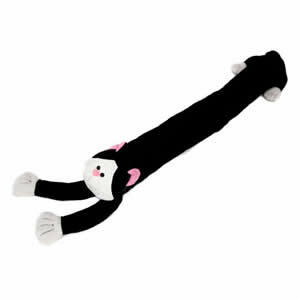 It is washable and a good sized draught excluder being 92 cm long 20cm wide. 400g in weight. Spotty Dog and Comic Cat Draught Excluders are real favourites and the ideal sizes of 92cm x 12cm and 87cm x 10cm. Now what do you do if you can’t find the perfect size of draft excluder? You may need it for a specific area, maybe you’re looking for draught excluders for windows or patio doors perhaps? You need a Draft Guard Insulator – perfect for keeping heat in & cold out. It’s ideal for all internal doors – and has the advantage of being able to cut to size for a perfect fit. 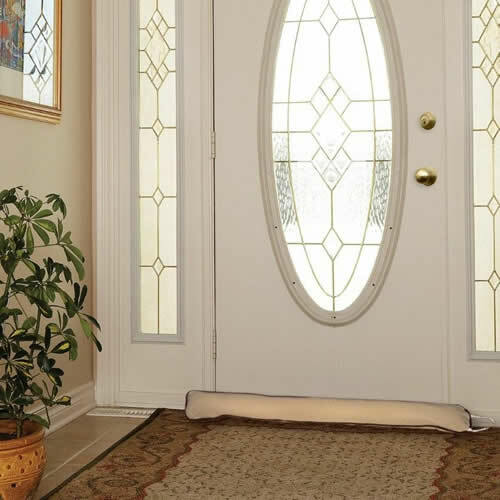 It easily glides over all types of floors and is double sided for double protection. It simply slides under the door and has a machine washable cover. Keep things simple (but effective) as it get colder and save money on those bills!